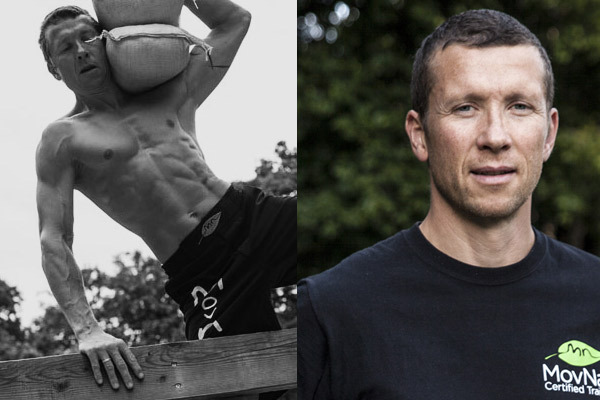 Erwan Le Corre has been called the world’s fittest man, and many have likened him to a modern-day Tarzan. Since founding the MovNat Natural Movement Fitness System, he’s taught thousands of people how to move naturally in order to become strong, healthy, happy and free. Below, you’ll hear from some of Erwan’s top students who are now ambassadors for MovNat all over the world. Note: These are all MovNat Level III Trainers: the highest designation in the MovNat coaching system, and/or Team Instructors: those who lead our certification events. We asked these movement masters about how MovNat has rocked their world, what they think people should know about natural movement fitness, and also for some practical tips for those who are new to MovNat. They shared a wealth of good advice and timeless wisdom for the aspiring fitness enthusiast and natural mover. What’s extraordinary about these people is that they all come from very different backgrounds, and yet, have each found a common bond with MovNat. If you pay attention to some of the common themes in their responses below, you’ll be well on your way to mastering your own movement potential. 1) What is your background and what inspired you to pursue and train with MovNat? Why have you stuck with it? How is your life and training different now? How is it better? I did sport all my life, but unlike all of my friends, I did not stick with soccer. I followed a Sensei for 20 years. During that time, I took up the studies of Sport-science and Classical Archaeology. I specialized in Ancient Sport and Sport-architecture. I built up a business on screening movement patterns of people, and I instructed courses in Karate and Boxing. After my Sensei went back home to Italy, being a Sensei on my own was not satisfying. At this time, I attended a MovNat Workshop in Berlin. From this point on it was clear MovNat is the Philosophy which was able to integrate all I learned in my previous life. My life changed completely. MovNat opened my eyes and my heart. It allowed me to discern right from wrong and lead the way where I belong – back into self-empowerment. 2) What is something that most people don’t understand about MovNat? What are they missing? People don’t understand themselves. Or, they shy away from themselves. The Industry managed to take their self confidence and the knowledge about their true roots – nature. They don’t see that they have all they need to become capable humans. After so many years of false promises from the conventional Fitness Industry, I think on one side people just eat everything the experts claim is good for them. On the other side, they don’t believe that there is still a system which has the potential to heal them physically and mentally. They miss a clear understanding of how nature works and the confidence to get back on that track. 3) What advice would you give to someone who is new to MovNat? Any recommended habits, simple changes, or tips for beginners who want to get healthier, fitter, and more capable? We have to concentrate on highlighting the simplicity and the mighty effects of MovNat, and we have to work on the missing scientific evidence of it. Little challenges und progressions for everyday life would be needed. Not just doing this and that. Not just “squat” but how to squat, why and how to get there, the transfer of it to the rest of the body and into new movement skills – little sequences to overcome the dangerous positions like sitting on a desk, standing, and the problem that people don’t know what to do. It’s a lifelong perspective. About Bernd: Bernd Reicheneder is a Level 3 MovNat Trainer. Team Instructor and MovNat Online Coach. He also runs his own business as a Personal Trainer, Coach and FMS-Specialist. You can learn more about his work at his website www.movnatmuenchen.com and find him on Facebook and Instagram.